In my life time I’ve submitted 372 expenses claims with over 8000 receipts. I’ve lost over 1000 receipts and had to accept I wasn’t getting that money back. It’s also taken me 372 hours of my personal time. I’ve had to accept bank charges and late payments and I’ve upset over 50 different co-workers. I’ve also approved over 4000 expenses forms and had to chase over 1000 missed receipts. In my own business I’ve also had to guesstimate exactly how much cashflow is being spent by my team, hoping that I’ve allocated enough, and I’ve had to give staff the benefit of the doubt hundreds of times, whilst getting into trouble with my accountant. So perhaps you can now understand why I use an expenses app. 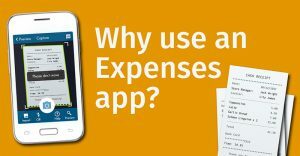 What you probably don’t know is why I co-developed an expenses app. Expenses are a problem for everyone – submitting, approving, entering and paying. Its causes animosity and friction between staff and takes up much more time than it should. An expenses app saves you time! Taking one less selfie and one picture of you receipt could save you 372 hours of personal time. It will definitely save you losing receipts and get your expenses paid quicker! Oh, and one less selfie of me in this world is absolutely a good thing! If you’re not going to use an expenses app, then I’ve got a few good ideas to help you save time. Put all your receipts in one safe place. Not the car! Where possible ask the hotel, restaurant or shop to email you a receipt. Don’t rely on your Bank statement. Why? i. The description of the charge doesn’t always remind you. ii. They don’t separate out VAT. iii. The date of submission can be different. iv. You might not get your statement in time. Complete them weekly. Leaving them to the last-minute only stresses you out and you will make mistakes. Use your phone (or a notebook) to record mileage. Don’t put a claim line through without the correct receipt, it only holds up the others. Do not under any circumstances try to change any of the formulas within an expenses spreadsheet. You will get it wrong, delay payment and upset accounts. If you are still using a handwritten expense sheet, give me a call on 01285 810606 and I’ll send you a excel template. Get a VAT convertor, do not try to work it out yourself. Know what you can and can’t claim for. Ask your accounts team for guidance the first time. It saves you time and stops them getting frustrated with you. Memorise the above or write it down. Do it right first time. Submitting an incorrect expense claim echoes point 10. So, in short, get an expenses app and make your life and everyone’s around you easier. There’s so much you could do with 372 more hours of time in your life. You never know it might just help with that work life balance everyone talks about! !